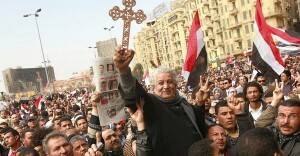 “For Egypt, the Christians are an indispensable force. They can contribute to opening up the country.” With these words, the Coptic Catholic Bishop of Assiut, Kyrillos William Samaan, affirmed the significance of Christians in the reshaping of Egypt. Since mid-February, Bishop Kyrillos has deputized for the seriously ill Patriarch of Alexandria (with headquarters in Cairo), Cardinal Antonios Naguib, as the head of the country’s Coptic Catholic Church. Although the Christians’ situation remains uncertain following the election of the former spokesman of the Muslim Brotherhood, Mohamed Morsi, as Egypt’s new President, the Bishop pointed out that it is positive that the President directly addressed the Christians in his first speech. Since promises have often been broken in the past, however, hopes are counterbalanced by fears. “Nevertheless, the Church is encouraging the faithful to remain and to help in the reconstruction of Egypt,” Bishop Kyrillos further emphasized during a visit to international Catholic pastoral charity Aid to the Church in Need (ACN). The Catholic leader described how Christians in Egypt are second-class citizens who face discrimination as part of their everyday life, and the latest political transformation has not altered this fundamental fact. Attacks by Muslims occur repeatedly, Bishop Kyrillos confirmed, and invective is the order of the day. As a result, Christians do not feel really secure and free. Given this situation, many younger people in particular want to leave their homeland, saying they have no future there. But the bishop said aid and solidarity from abroad can give them new perspectives and encourage them to stay. During his visit, Bishop Kyrillos thanked ACN for its ongoing involvement in Egypt. For many years, the charity has supported projects on the Nile that serve the aims of training and education, dialogue and reconciliation. In Tema, a small town some 249 miles south of Cairo, ACN helped to fund the building of a multi-story pastoral center. The new facility has strengthened the local congregation and led to a sustained improvement in its situation. The bishop said that Christians in Egypt help convey a sense of respect for others as well as the willingness to take responsibility for others and to live together in peace.